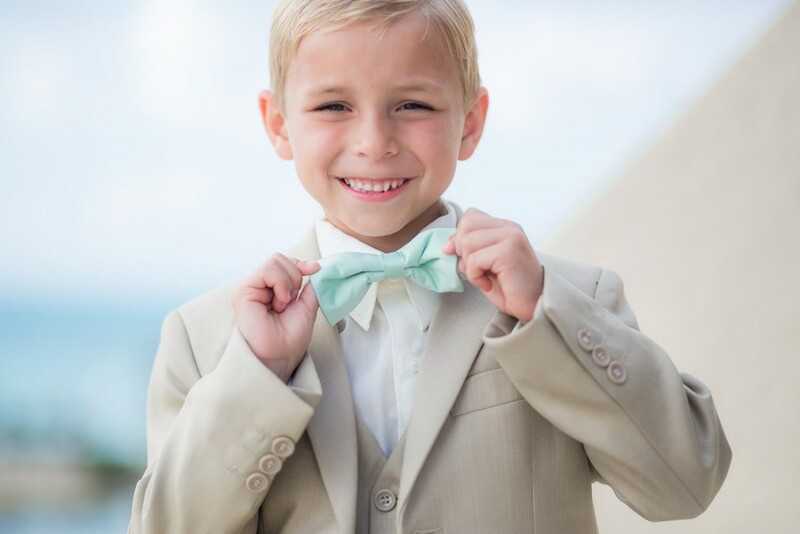 Bow Tie Advice from a Cancun Wedding Photographer. I always love a good comeback story, don’t you? In my world of Cancun weddings and weddings in general, one item that seems to be making a big comeback is the bow tie. Yes, you read that correctly. The bow tie has always been a symbol of class when it comes to men’s style, but a big move toward casual attire saw more and more weddings completely bow tie free. Heck, we barely see any ties when we are on the beach. Luckily, you can’t keep a good tie down and the bow tie is back in business. And as a Cancun wedding photographer, I am here to tell you that it is even back in business on the beach! For some of you, this concept must seem totally ludicrous. One of the main reasons you shunned a traditional church wedding was for the casual feel of the beach. And if you are in “trash the dress” mode and just can’t envision your Cancun wedding photos with any sort of tie, then you are absolutely right. However, if you are mixing some traditional style with the magic of the beach like so many couples down here, then bow ties have several benefits. First, they are the epitome of classy male fashion and they really don’t look out of place on the beach at all. Second, the function of a bow tie suits the beach because unlike a regular tie, they won’t blow up into your face every time there’s a breeze. Third, they are very easy to maintain throughout the course of the day, which gives you the time to focus on your wedding and your new bride rather than cleaning surf and turf off your tie during the reception. That’s not to say a traditional bow tie is easier than a clip-on. Tying your bow tie is definitely a challenge, and it has left more than a few grooms and groomsmen cursing the day they decided to wear them. Of course, a little time and practice is all it really takes to master the bow tie. The biggest problems occur when you get bogged down in the details of your Cancun wedding and completely forget to learn this vital skill before the big day. Imagine taking every necessary step to plan and set up the perfect beach wedding, with your family and friends in attendance, Cancun wedding photographer ready to capture it all, and you realize that you have no idea how to tie the bow tie. This is a scenario I actually witnessed, and not one guy there knew how to tie a bow tie properly. Since we were on a beach in Mexico, there wasn’t a whole lot of help available. Luckily, the hotel was close by and it did have a wifi connection, so someone was able to take a quick look at a Youtube video and get them all tied properly. It turned out great and the guys were even joking about it, but it could have turned out much differently. The moral here is, learn how to tie your bow tie before you get on the plane and leave for your wedding. It looks complicated, but after a handful of tries you’ll get the hang of it. Or, if you don’t want to do it, assign the job to one of your groomsmen and he can tie them for everyone. Here are a few videos that will help you out. Download one or all of them to your phone before you go, just in case you need some last minute pointers before you walk down the aisle. Finally, a fun one from Jesse Tyler Ferguson and lets face it, I had to provide a sample from a gay man. It would feel wrong to not include one from a gay male as 90% of my stylists in my commercial career were gay men, so they tend to be my go to for style. And trust me, I don’t buy my pants as tight as they would like either… that is just wrong. And thank you for helping to bring the awesome bow tie back to life!